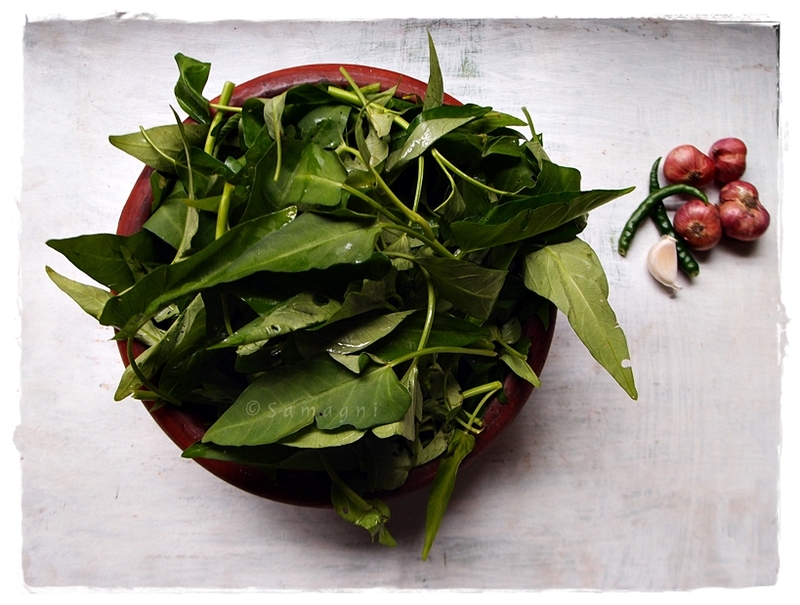 Spinach or the Swamp Cabbage called Kalmi saag (Hindi) and Vayal cheera (Malayalam). Like most other greens, there are numerous health benefits of consuming this spinach. It is rich in antioxidants and strengthens the immune system. It is also excellent to relieve issues of constipation and even reduce menstrual pain! Water spinach is a rich source of calcium, iron, amino acids, and vitamins B. The plant, its leaves and flowers look very similar to that of sweet potato. They belong to the same genus of plants. The stems are hollow. You can use the leaves and tender parts of the stem for this dish. When they splutter, add the split green chilies. Add finely chopped onion and garlic. Saute until they turn pink. Add chopped water spinach leaves and turmeric powder. Mix well and close with a lid. become soft and darker in color. Turn off the fire. Add salt and grated coconut. Mix well.